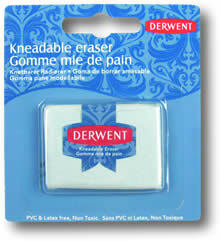 The Derwent Kneadable Eraser is a soft and pliable eraser which is great for lifting out colour and tone. You can shape a small piece to suit your needs to gently and accurately lift out pencil in selective areas of your drawing by using a dabbing action with the eraser. It is a good idea to keep the Derwent Kneadable Eraser in the wax paper it comes in as it helps the eraser to stay fresher for longer.